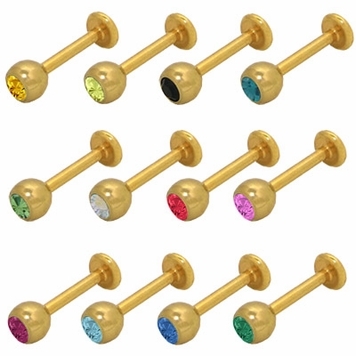 This is a glitzy labret monroe lip jewelry made from 316L high grade surgical steel that is 14 karat gold electro plated and a jewel available in your choice of pink, orange, light blue, dark blue, light green, purple, red, black yellow, opal, green, or turquoise. The comfortable flat end measures 4mm. The size is available in your choice of 14 gauge and length of 8mm-5/16inch, 10mm-3/8inch, or 12mm-1/2inch. The entire piece is nickel free.